In my family, we are big fans of William Bee's Stanley series. Stanley is a hamster who, in each of his books, takes on a different career. To date, Stanley has been a builder, a mechanic, a farmer, a mailman, and a cook. His friends, a recurring cast of various rodent characters, are often customers or coworkers in each new work environment. Text and illustrations work together in each book to introduce vocabulary and tools used in the particular job which Stanley performs. 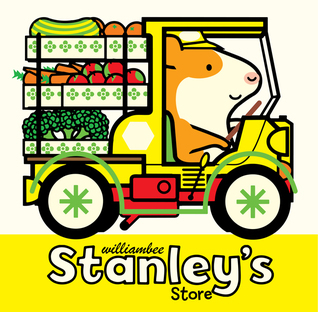 I'm very pleased to say that the newest Stanley book, Stanley's Store, is now available! I was lucky enough to receive an unbound ARC from Peachtree Publishers, and as always, it was an enjoyable read. 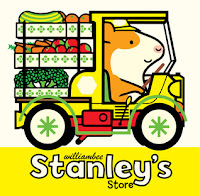 Stanley's newest job is that of grocer. The book opens with a view of the entrance to the store, where signs are posted showing what is on sale (ketchup, "Biz" laundry detergent, baked beans, etc.) Inside the store, Stanley works on unloading vegetables, while Hattie and Gabriel sell cheese and bread to Myrtle, Little Woo sneakily fills his father's shopping cart with cookies, and Charlie has a mishap involving Stanley's carefully arranged produce display. Like Stanley's Diner and Stanley the Mailman, this book includes lots of print outside of the main text. There are signs on the front door of the store, as well as labeled gas cans. Each grocery item on the shelves and in carts is labeled, as well as all the vegetables on Stanley's truck, the bag of coal near the bakery oven, and even the back door at Stanley's house. There are also opportunities to identify numbers, particularly in the deli scene where the cheese is labeled with prices, and at the checkout when Stanley's station is labeled as aisle 3. Little Miss Muffet (3 years, 3 months) loves to point out familiar letters and numbers in picture book illustrations, so this is especially appealing to us right now. Kids spend a lot of time tagging along on grocery trips, so this book has an instant connection to their everyday lives. While some of the situations, such as sneaking treats and knocking down fruit are cliches, they will be new for preschoolers, and little ones will love seeing these moments of excitement taking place during an activity which is typically so ordinary and sometimes just plain boring. Fans of the series will also love seeing appearances from their favorite characters. All of us love Little Woo, and we enjoyed his impishness in this book. And maybe it's just me, but I also enjoy rolling my eyes at Myrtle, who always seems to have some sort of problem, from ordering a hat that is too small (Stanley the Mailman), to needing to have her car towed (Stanley's Garage), to ordering so much cheese in this book that she needs to be driven home by both Stanley and Hattie. This is another great installment in the Stanley series. Grandma already ordered a finished copy to give Miss Muffet for Easter, and it won't be long before Bo Peep begins enjoying the books as well. This is my favorite series for toddlers and preschoolers to learn about the roles of different helpers in the community. I hope there will be more books to come!